This historic image is of a section crew under the supervision of George Stevens along the White River Railroad. The image is centered on a type of railcar sitting on the tracks. It is unclear whether it is powered by coal or by hand since it is stopped on the tracks and its purpose is for construction. Many workers are gathered around the railcar, and three men in suits are to the right of the tracks. 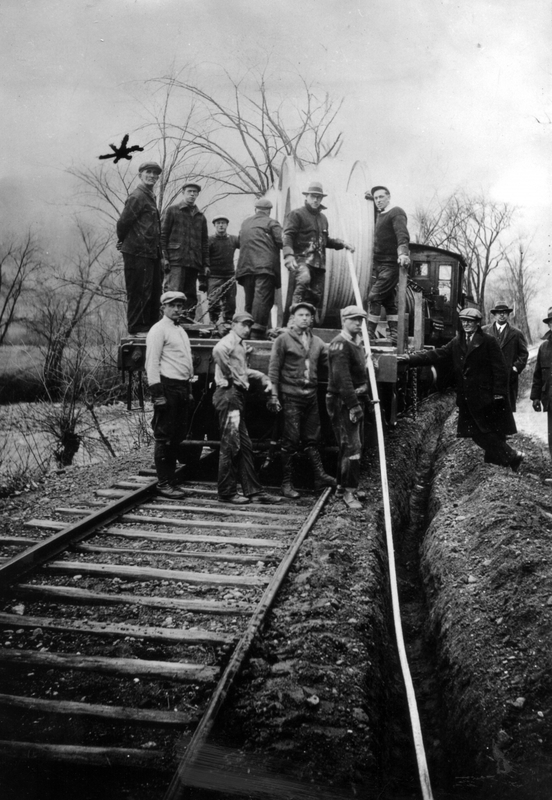 The men are laying down some type of white piping or tubing in a small trench to the right of the tracks. The trench does not look like it is more that a couple of feet deep. The soil appears to contain a lot of till and rock fragments. In the background to the left of the image, there appears to be a larger ditch, which could be a river or brook. Behind the ditch are large empty fields. The trees in the image are scattered along the ditch and the tracks, and have lost their leaves. The season is most likely fall. Postcard sent in 1909. Postcard style dates no earlier than 1907.